"About 2.7 million Americans served in the Iraq and Afghanistan wars, and at least 20 per cent of them have Post Traumatic Stress Disorder (PTSD). The US Defense Advanced Research Project Agency (Darpa) says it can reduce this number by treating war veterans using chip implants. Researchers at the organisation say wireless 'neuroprosthetic' brain implants will also help restore memory functions and heal traumatic brain injuries." High-tech robots called PackBots will be unleashed during the 2014 FIFA World Cup in Brazil to help boost security and examine suspicious objects. The Brazilian government purportedly spent US$7.2 million to buy 30 military-grade robots from designers iRobot that will police the stadiums throughout Brazil’s 12 host cities during soccer matches. PackBot is a hunk of metal with an extendable arm and tactile claw, jam-packed on-board sensors and a computer with overheat protection, nine high-resolution cameras and lasers and two-way audio. But is it overkill to implement wartime robots to a sporting event? On April 30 1993, then-world number 1 tennis sensation Monica Seles was stabbed in the back while playing a quarter-final at Hamburg’s Rothenbaum. She was only 19. That incident not only changed the course of women’s tennis history but also changed the face of security in sport. Of course, we can also point to the Munich massacre of the 11 members of the Israeli Olympic team during the 1972 Summer Olympics in West Germany in rethinking approaches to the safety of high-profile athletes. It was Seles’ plight however, that brought attention to an ever-increasing problem of public figure security. Her stabbing in Hamburg had naught to do with terrorism, and more to do with her perpetrator’s fixation on arch rival Steffi Graf. Player safety was going to become even bigger business. It was floated that the Rothenbaum tournament organisers had spent A$650,000 on security, and that Seles herself had employed security guards to protect her at all her tournament appearances. So what went wrong? Not only are people unpredictable but intervention is almost impossible if one cannot anticipate the actions of another. On November 13 1982, one of Australia’s great wicket takers Terry Alderman made a costly mistake when he took security matters into his own hands. The West Australian was disabled for over a year with a shoulder injury he sustained when he came off second best after attempting to tackle an English-supporting ground invader at the WACA Ground in Perth. 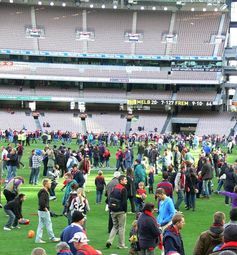 The after-game kick-to-kick tradition at the MCG is a rare sight these days. Such has become the concern over security that spectators can no longer spill onto the grounds after the final siren to get close to their heroes. 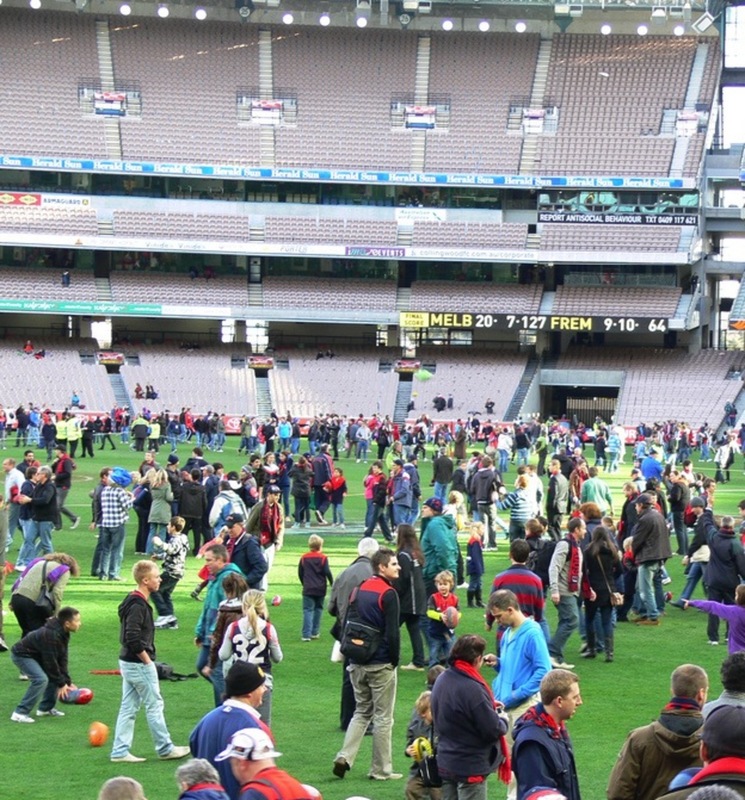 Pitch invasions had long been a tradition of Australian Football League (AFL), and at the end of matches supporters could run onto the field to celebrate the game and play kick-to-kick with their family and friends. But in recent years stricter controls were introduced and finally the “rushing the field” was banned, to the great disappointment of fans. What makes PackBots attractive for civilian security situations, such as large-scale sporting tournaments? This began a trend of development subsequently in Iraq and other US conflicts, until recently when they went where no human would want to go, the Fukushima nuclear facility in March 2011 after the devastation of the Japanese tsunami. There are certainly positive uses to these uninhabited systems which few would argue against. The next generation warrior: Packbot in the field in action in Afghanistan in 2002. PackBots can move faster than 14km/h, rotate 360 degrees, traverse rugged terrain, climb up 60% grades and even swim in water, being able to cope with being submerged up to two metres. It can even be remotely operated with hardly any lag using a joystick. iRobot’s bots are not recent entries into the commercial market. No, many of us would have been introduced to the domestication of the robot by the introduction of the company’s Roomba household cleaning machine. Roombas: sometimes for cleaning, often for cat videos. And the use of electronics in sport isn’t new. Hawk-Eye officiates whether the ball was in or out of the sideline, FoxCopter hovers above spectators at the cricket just to give us up-close personal shots of players and the third umpire adjudicates challenges. But now the PackBots are coming: ostensibly precise, they are not supposed to malfunction or act against the controller’s wishes (or those instructions that they have been programmed with) and they cannot be easily destroyed. In the not-so-distant future they could use their cameras to observe you, their chemical sensors to breathalyse you, their extended arm to trap you and their claw to handcuff you. We are giving over control to machine entities, or better still, “objects and units” outside of ourselves. In fact many argue we have already lost great chunks of our autonomy without the expected commensurate increase in security. Will the natural instincts and creative inputs of human beings become increasingly redundant in a world where the “tin man” has the final say? Katina Michael receives funding from the Australian Research Council (ARC). She is affiliated with the Institute of Electrical and Electronics Engineers (IEEE) and the Australian Privacy Foundation (APF). MG Michael does not work for, consult to, own shares in or receive funding from any company or organisation that would benefit from this article, and has no relevant affiliations. "On paper you can invent anything. The difficult part is bringing what is on paper to life, or so it would seem. Empire North, is an intriguing slice of docu-fiction that explores this very notion of creativity, and in doing so attempts to break down the barriers between life and art. Danish artist Jakob Boesko directs and stars as Jakob Valdason, a cartoonist who conceives of a fictitious futuristic rifle called the ID Sniper; a high-powered weapon that can implant a GPS microchip into the body of a human being. The rifle works as a long distance injector with the microchip entering the body causing no internal damage and only a small amount of physical pain; that equal to a mosquito bite. Valdason creates a new identity for himself; no longer is he Jakob Valdason, the poor cartoonist, but rather Jakob Valdason, the polished CEO of the fabricated weapons company, Empire North. With his new persona, along with a prototype for his ID Sniper, Valdason travels to a weapons fair in Qatar to unveil his futuristic rifle to the international weapons community. His objective: to take a product from the future with a combination of technologies not yet seen, bring into the present, and see if people accept it as real. With Empire North, Jakob Boesko gives us a brief glimpse into the unsettling realities of the international arms trade. Over 1.5 trillion dollars are spent on military expenditures worldwide annually, in what is essentially a deceiving competition to uncover the next big weapon of the future. When foreign developers begin to flock to Valdason and Empire North; when his indox becomes overwhelmed with interested parties ranging from developers, investors, and military officials, reality sets in that while the ID Sniper is a fallacy, the fascination around it and what it could potential provide, is anything but fallacious. In describing the modern world during a voice over, Valdason is quoted in saying, ‘this is the decade of deception, the era of fiction’, and no where is this supposition more prevalent than in the international arms trade, where the global jockeying for control can often eclipse any form of moral compass. Where profits and power can dominate in the name of security, safety, and rights of freedoms." "...Researchers at the University of Texas demonstrated to officials at the US Department of Homeland Security (DHS) how drones could be hacked into through their navigation systems. Known as “spoofing”, a false signal through the Global Positioning System (GPS) could be used to “trick” the drones into going onto a new course. "...DARPA links human brainwaves, improved sensors, cognitive algorithms to improve target detection ."